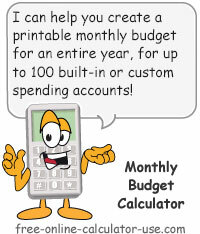 This free online Budgeting Percentages Average Calculator is based on Table 1203. Income before taxes: Annual expenditure means, shares, standard errors, and coefficients of variation, Consumer Expenditure Survey, 2017, conducted by the U.S. Bureau of Labor Statics. Simply enter your annual before-tax income and the automatic budget generator on this page will calculate the budget percentages and average household expenses reported by Consumer Expenditure Survey respondents in your income level. You can then create a sample budget based on income that you can print out and use as a reference point for revising or setting up a budget. 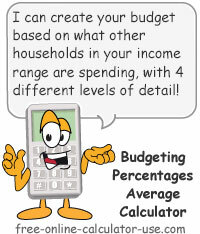 Calculate budgeting percentages and amounts based on income and budget percentages of other households in your bracket. Enter your annual before-tax household income. The calculator will automatically look up the appropriate average budgeting percentages and dollar amounts for your income level. Select the level of budget detail you would like to display in the results. A level 1 will only list the 14 main survey categories, whereas a level 4 will display all 97 budget line items contained in the Consumer Expenditure Survey. You can change the detail level before or after calculating the budgeting percentages and average expenses, and as often as you like. Select whether you want the chart populated with monthly or annual amounts. You can change the reporting period before or after calculating the budgeting percentages and average expenses, and as often as you like. This is the total average annual expenditures for the income bracket your annual income falls into. This is the total average monthly expenditures for the income bracket your annual income falls into. Enter your total household's annual before tax income. Select your preferred detail level. Select whether your want the reporting period to be monthly or annual. 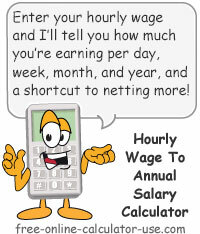 Click the "Calculate Budget Averages" button. This will create and display an average expenditure chart based on your income bracket, which will include a button to create a printable budget worksheet based on the period, detail level, and your income bracket. This survey is conducted by the U.S Bureau of Labor Statistics and is the basis for the results calculated by the budget percentages average calculator. Specifically, the calculator uses Table 1203. Income before taxes: Annual expenditure means, shares, standard errors, and coefficient of variation, Consumer Expenditure Survey, 2017. Considering that the average American family has a mountain of debt and little if any savings, do you really want to strive to achieve the average family budget percentages? In fact, part of my motivation for creating the budgeting percentages average calculator, was to show you where you don't want to be -- average or worse. 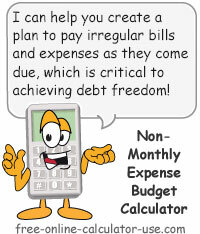 Instead, your goal should be to try to spend less than all monthly household expenses calculated by this calculator, and then use your budget surpluses to get out of debt as quickly as possible. Once you manage to get out of debt you will then be able to apply all of those freed-up debt payments for going from debt to financial freedom. Just imagine what it will be like to wake up early on a Monday morning -- not because you have to -- but because you can't wait to get to work at something you love without having to worry about how much it pays. While the results generated by the budgeting tool on this page can serve as a reference point for setting up a budget, they certainly don't represent an accurate record of your actual expenditures. And without accurate records from which to base your budgeting on, your budget will be as dangerous to your personal finances as a faulty air tank gauge would be to a deep sea diver. If you are going to take the time and effort to create a household budget, why not take the necessary steps to insure that your efforts prove to be worthwhile? The first of those necessary steps, is to make a religious habit of recording every financial transaction that occurs in your day-to-day life. Without that first step, none of the other steps can be taken with any degree of confidence.